it's an opportunity to gather your thoughts and relax and come up with ideas. 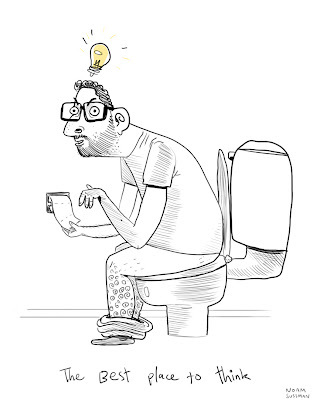 sometimes the idea is so great you run out of the washroom mid-poop just so you can write it down. sometimes I brainstorm with my friends in the washroom. We gather around the toilet and splash toilet water at each other's faces. sometimes we even go skinny dipping, which involves taking off our socks and dipping our feet in the toilet bowl. these activities often help generate ideas. you too should give it a shot if you feel stuck or uninspired.